This is the necklace I made for Sparkleknit’s birthday in June. 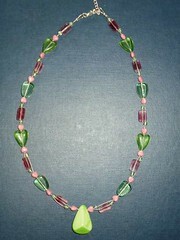 I couldn’t resist the green and pink beads as they are her favourite colours! 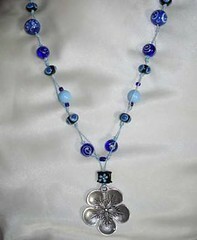 This is the necklace I made using the beads I showed you last week. It was made to go with my blue shoes of happiness and it does match really well. The silver flower bead in the centre is perfect as a weight so that I don’t have the “bead problem” (ladies with a larger bust will know what I mean!!). 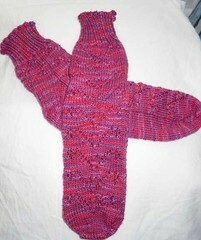 And these are the On Hold socks from Wendy Johnson’s Socks from the Toe Up book. 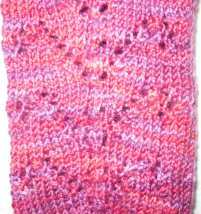 I used the rest of the second skein of Wild Cherry – Cherry Tree Hill Supersock yarn that I made my Wild Cherry Demeter from. I did a Judy’s magic cast on, a slip stitch gusset heel, a twisted rib and finished off with a Russian bind off which is lovely and elastic. They fit me perfectly!! Going to Handm@de the other week has inspired me to create so I’m attempting to produce something I can sell. Work is completely awful at the moment so I need something else to keep me sane!! I’ve done some sketches and made a prototype which needs some tweaking so it may be quite a while before you see it. Having completed my On Hold socks last night I think I need to do some finishing before I cast on anything else. I have got the Lacy Tea Top and Honeycomb Tank Top both stuck at the armhole point so I think I’ll work on one of those. I also need to block my Aeolian shawl as I finished it in June!! Alice from Rasberry had organised a Handm@de craft fair on Sunday 5th July with 45 stalls of wonderful things all made by Hand!! I’d read about it on her blog and thought that it might be nice to go, then I picked up a leaflet about a week long craft show in the grounds of Winchester Cathedral at the same time. By then my car had died and I thought it would be worth the train fair if there were two events to go to. On Saturday 4th I discovered that it was also the Hat Fair (a fair of street entertainment that has been happening for over 30 years) which couldn’t be better timing. So on Sunday mum and I headed off to Winchester on the train. On the way to the Guildhall from the station we were distracted by 2 guys juggling on unicycles and generally being very funny by the Buttercross. The Handm@de fair was in full swing when we got there with all 45 stalls set up and looking great. It was so nice to see and meet the people who made the things for sale and they were all very reasonably priced. I think Alice and the other organisers did a brilliant job and I would definitely go if they did another one. I particularly liked Frankie‘s vintage jewellery, Paperleaf’s printed cards, Blue Fairy’s glass coasters and Cococraft’s lovely purses and bags. We then headed to the Cathedral for the posh craft fair organised by various local guilds of craftsmen. It was a beautiful collection of items but it was lot more impersonal than Handm@de. I was extremely taken with some stained glassed kaleidoscopes but at £150 a go I couldn’t really afford to buy something I would forget to use. It was inspiring but some of it was a little unattainable at the moment. I did love the altered clothes by Marsha Swanzy. After lunch in the cathedral grounds we went to Oram Fields and watched my best friend’s (not so little anymore) brother in The Black Box presents the Little Box of Horrors. It was a really nice day out, the weather was beautiful and I was extermely inspired by everything I saw. Now I just need to capture some of the ideas I had…..
Knitting group was a success last Sunday. Nic and I went along to the Poultry Cross in Salisbury at the designated time where Bexx and Goldfishgirl were waiting for us, then Apricotqueen arrived with her daughter and we took ourselves to the nearest coffee shop. Safely ensconced in a corner with beverages and cake we began to knit and get to know each other. The other 3 ladies already knew each other and as Nic and I did too it wasn’t too awkward. 2 of the others spin aswell so I was able to ask questions about the difference between roving and silk hankies and other terms that I hadn’t quite got the hang of when listening to podcasts. I knitted my On Hold socks while Nic carried on with her blanket which she is knitting in a myriad of pinks for her craft/study room. We’re hoping to have another knitting session on 26 July when Daintykitty has moved to Salisbury from the US and hopefully Ebolajez and Shazspun will be able to make it too. Nic has just got an iPod for her birthday and is discovering the joy of podcasts so I’ve recommended Sticks & String and Cast On and I’m will be trying the two she suggested for me (I’ve forgotten the names right at this minute…) when I’ve sorted out my laptop’s memory issues. I’ve not knitted a great deal this week as the weather has been ridiculously hot for the UK. But I have made myself a long necklace, bracelet and earrings from some green chinese beads I bought in London at The Bead Shop on Tower Street. I was given some gift vouchers for the local bead shop so I bought extra beads, charms and the chain to make the jewellry with my voucher. 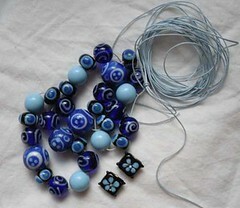 I had some credit on the voucher left over so today I bought these wonderful blue beads which I plan to make into a long necklace to match my blue shoes of happiness. Tomorrow mum and I are heading to Winchester by train to the Handm@de craft fair in the guildhall and the craft exhibition in the Cathedral. Should be a good day out especially as it’s the Winchester Hat Fair too.